From memory, you could sign up for Google alerts to stay informed about a topic without having to enter a Gmail address. Then, Google started pushing to disallow other email addresses, in favor of Gmail. Then, you could choose other email addresses, but only if you had registered them with Google. Currently (about to roll into 2016), Google lets you sign up with any email address you want. This takes place as Google has backed off bullying users into using Google+ for YouTube, for example, so let's hope that this trend sticks! I'm assuming that you are logged into some kind of Google product at the moment, so I'll show you how to sign up for an alert without logging out of your Google account. 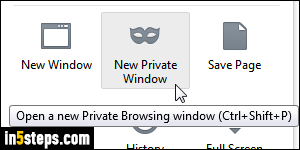 Open a "private browsing" window: on Windows 7 / 8 / 10 and Linux, hit either Ctrl+Shift+P (Firefox, IE) or Ctrl+Shift+N (Chrome, Opera). On Mac OS X, hit Cmd+Shift+N in any browser, or Cmd+Shift+P in Firefox. A private session lets you temporarily browse anonymously, not logged in. Now, in that private window, go to https://news.google.com/ - type the topic or keywords about which you want to stay informed. 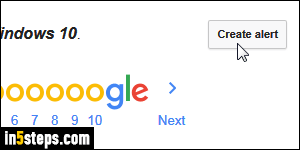 Note that all advanced search operators also apply to Google News: you can exclude search terms or websites, find exact matches (like "Windows 10", with the quotes), only show results from a specific site, or only search for specific file types. Launch your search to get a preview of the news results you would typically be getting. If you are satisfied, click on the Create alert button at the bottom: you'll be redirected to a page that lets you enter ANY email address you want to subscribe to that news alert. Click on the Show options link to customize your alert: pick how often you'd like to be notified, the language of news sources Google will crawl, optionally narrowed down to a specific region. In my experience, choosing "Only the best results" will still give you plenty of results. 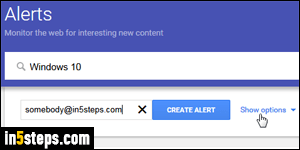 Click on the Create Alert button to subscribe to that Google alert, and go click on the confirmation link sent to that email address' inbox. (If you can't find the verification email, check your spam folder before trying again.) You can bypass the Google News page to create or manage your alerts by going directly to https://www.google.com/alerts - and each alert email you receive contains an Unsubscribe link at the bottom, to discontinue that particular alert at any time.